Cut down on your wedding costs by nixing expensive flower arrangement centerpieces and opting for something more unique. 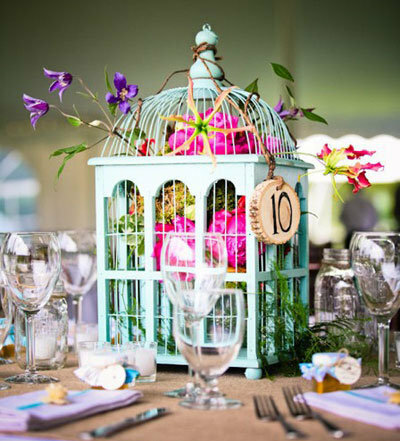 For a garden wedding with a rustic feel, display large, colorful bird cages on tables for a simple, yet eye-catching, centerpiece. Weave ivy or a few flowers into the cage if you choose, or set a few candles inside to create a more intimate mood. Birdcage created by Emily Herzig Floral Studio; Photo by Meg Hamilton of Rodeo & Co.
For a cold-weather wedding, lanterns are a cozy touch for your tables. Choose vintage-style metal lanterns that play off rich hues in autumn; or, apply this idea to a summer wedding by choosing sleek white ones instead. Place a single pillar candle inside the lantern, and adorn the lantern with appliqués that coordinate with your color scheme or wedding theme. 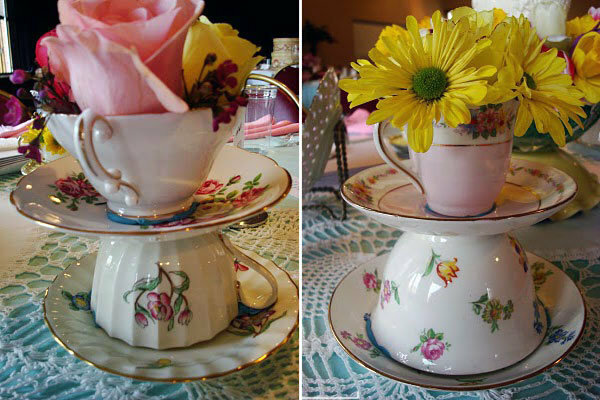 For a springtime wedding with a country-chic vibe, a teacup centerpiece is the perfect marriage of elegant and eclectic. Peruse your local flea market for vintage china. Or, even better, ask your beloved family members if they have any to spare! Stack your cups and saucers as seen below, using a touch of sturdy glue to hold the pieces together. If desired, grace each top cup with a single flower. Set colorful votive candles and strands of faux pearls around the display, and you have a unique, whimsical centerpiece that will delight guests at your reception. Bring the actual beach to your seaside wedding reception by filling clear glass vases with sand and tiny shells. Stick a taper candle in the center of each vessel. Then, arrange larger shells, starfish, and coral branches on a platter surrounding the vessels. 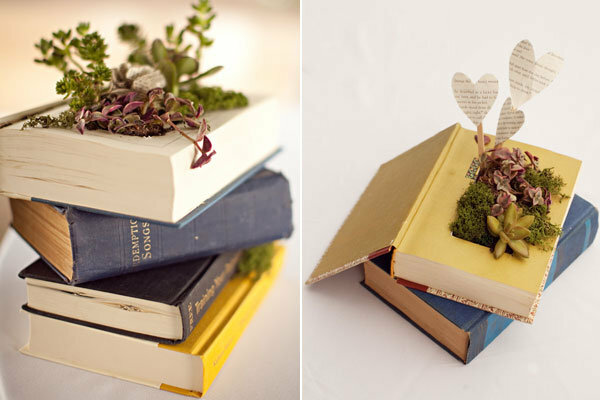 Allow your guests to lose themselves in a good book by stacking classic novels on your tables. For an unexpected twist, cut out the center of the top book and add some moss. Then, cut out a few hearts from the pages you just removed and attach to popsicle sticks. You can also write your table numbers on these heart-shaped appliqués. Bonus points if the centerpiece books have romantic titles or are filled with lofty love poems! 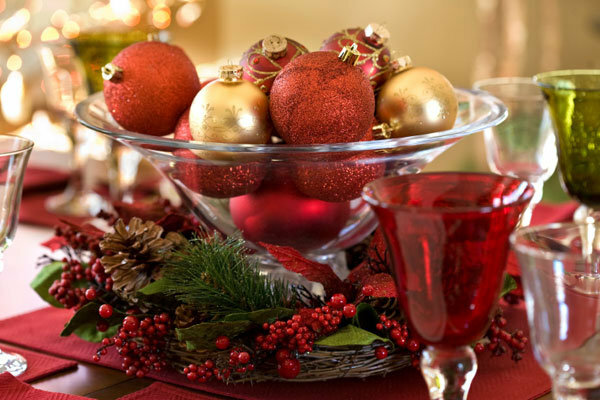 If you’re holding your wedding during the hustle and bustle of the holiday season and want to add a festive touch to your tables, fill glass vessels with ornaments that fit your color scheme—you can buy them in bulk on amazon.com. Then, add wreaths of faux holly, ivy, berries, and pinecones around the bottom of each vessel for an easy yet beautiful centerpiece that glistens next to flickering candles. Bonus: These centerpieces can double as holiday décor for years to come after the wedding! Ripe fruits symbolize abundance and fertility; and they can be turned into a gorgeous, colorful centerpiece for any wedding. 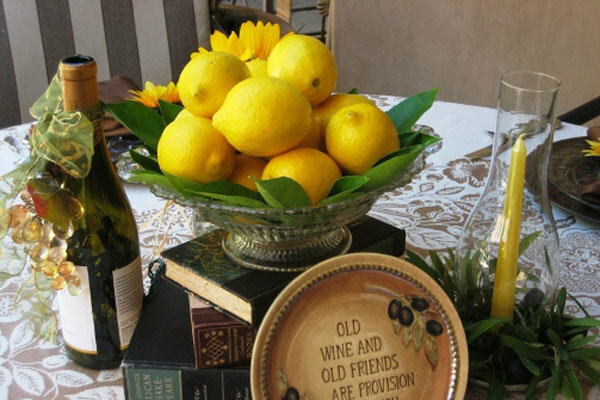 In spring or summer, fill large bowls with bright lemons, limes or oranges for a centerpiece that really pops. Planning a tropical wedding? Use pineapples and coconuts. 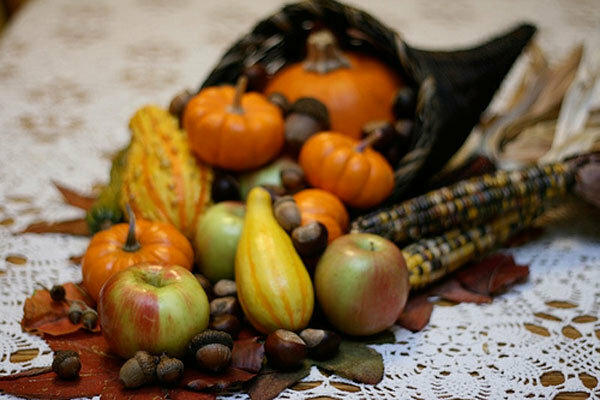 In autumn, picnic baskets overflowing with red, yellow, and green apples creates a centerpiece display that reflects the colors of the changing leaves. And in winter, bowls of red berries are a cheery centerpiece, especially when accented with pine cones or snow-painted branches. Bonus: Guests can take a piece of fruit home for a post-wedding snack! For an autumn wedding, a colorful spread of pumpkins, cornhusks, apples, gourds, and leaves spilling out of a horn-shaped wicker basket is a traditional and beautiful centerpiece. Whether you use real produce from a farmer's market or artificial from a craft store, this easy centerpiece is sure to wow your guests. For a clean, contemporary centerpiece that doubles as a table number, gather wine bottles that compliment your color scheme. Print out large, graphic numbers and stick them on top of existing labels on the wine bottles. This centerpiece is especially fitting if you are holding your wedding reception at a vineyard or winery. Place herbs from your local farmer’s market such as oregano, basil and tarragon in sleek pots to give your reception’s modern setting an organic feel. Create a pretty tablescape by surrounding one larger pot with several smaller ones. Or, place your potted herbs down the center of the table with one in front of each place setting, and urge your guests to take one as a favor when they leave! Introduce your guests to a whole new eco-friendly world with terrariums. Not only do terrariums hark back to memories of third grade science projects (hey, we miss third grade sometimes! ), they're easy to create and make a surprising alternative to traditional floral arrangements. To put a new spin on universe creation, substitute dirt and moss for sand and seashells to create a dreamy seaside fantasy. 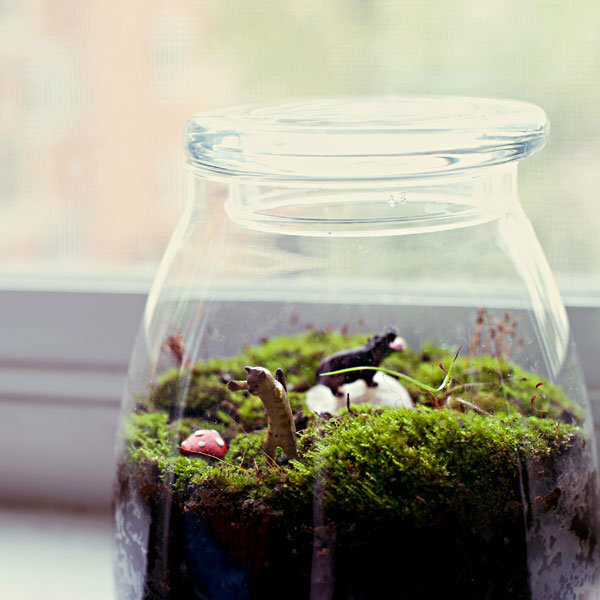 Personalize the terrariums with miniatures such as animals or houses to create your own little completely green world. 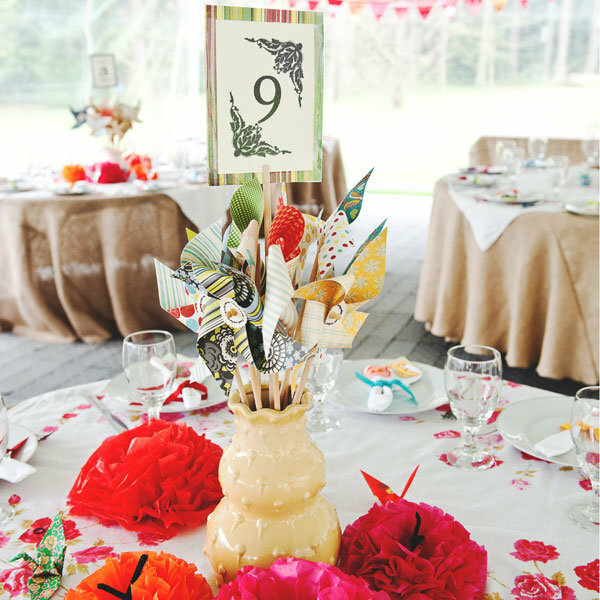 Perfect for an outdoor wedding, these paper pinwheels bring a sense of nostalgia to your wedding. While pre-made ones are readily available for purchase, save money—and make them more personal—by crafting them yourself (get instructions here). Host a craft night for pinwheel assembly with your bridesmaids; create a friendly competition by dividing the group into two teams and seeing which side can make the most pinwheels (be sure to pick up some cute prizes for your winners!). Attach assembled pinwheels to straws or wooden sticks. Place clusters of pinwheels in mix-and-match jars or vases on your tables. Up, up, and away! For a whimsical wedding, guests will love this unique hot air balloon centerpiece. Gather balloons that go with your color scheme and inflate with helium. Then, use a mesh net (found at a craft supply store) to connect the balloon to a small basket. Make sure your basket is weighed down by putting marbles or vase fillers. If desired, cover the weights with faux flowers to hide them from sight. Get your inspiration from the greatest show on earth: A circus! This DIY centerpiece couldn't be easier. 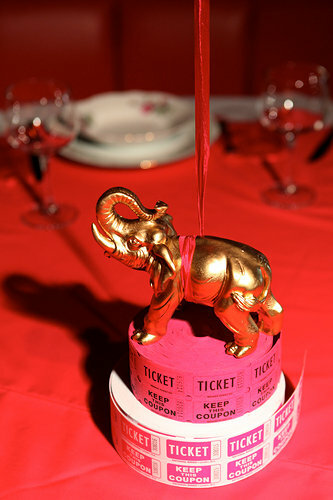 Head over to your local dollar or party supply store and pick up several rolls of raffle tickets. Or, have custom tickets created with your names and wedding date. Also at your dollar store, grab several circus animal knick knacks. Coat each with gold spray paint, and ta-da! You now have a bunch of wild animals you can easily control. This delicious-looking centerpiece doubles as a wedding favor—and it's a cinch to make. In a glass vessel, layer colored sugar, sand, or crushed candy. Then, stick in a few pinwheel lollipops that coordinate with your color scheme. Make sure there's at least one for each person at the table, and you're done!